In Logans Leisure #2: Building an end table subwoofer, I detail the process of how I built my first "DIY" subwoofer. Because I'd received lots of questions about it, I wanted to go into some depth about some of the process. However, I didn't want to clutter up the build post with this "technical" portion. This is not meant to be an all inclusive guide, because frankly, I'm not an expert with WinISD, or with building subwoofers. However, when I was working on designing my subwoofer, this is the stuff that I was wanting to find online but took more than a few minutes to find. As it turns out, there are a few guides out there that exist. This is not meant as a replacement, but instead as a supplement. This is a BRIEF intro on how to use WinSD. I learned the basics by stumbling around on my own, and checking out threads on hometheatershack.com (the forums). So if you're keen to start your own project and have questions, then the best place to look would likely be there, as by most ways of measuring, I'm at most a novice at this type of work. However, finding all of this information was difficult for me, so I'm trying to present what was hard for me to really find. The first thing you need to do after installing WinISD (I downloaded from HERE)is to make sure that it has the driver that you are wanting to use. If not, then you either need to create the WinISD driver file, or download one from the internet somewhere. If you check out hometheatershack and their driver file thread, you may find that someone already created one for you. That's where I got all of mine. After you have the drivers that you're interested in, you now need to create a new project. The project should be the type that you are wanting to create (sealed, ported, etc). You'll also use the driver file that you just got. After you create the project, you are first presented with the driver tab. However, since you already chose the driver, this tab doesn't really help you much. The next tab is where I found myself doing most of my work. It is the "box" tab. This is where you specify the settings used on the enclosure. This is where you choose the tuning frequency, and the volume. 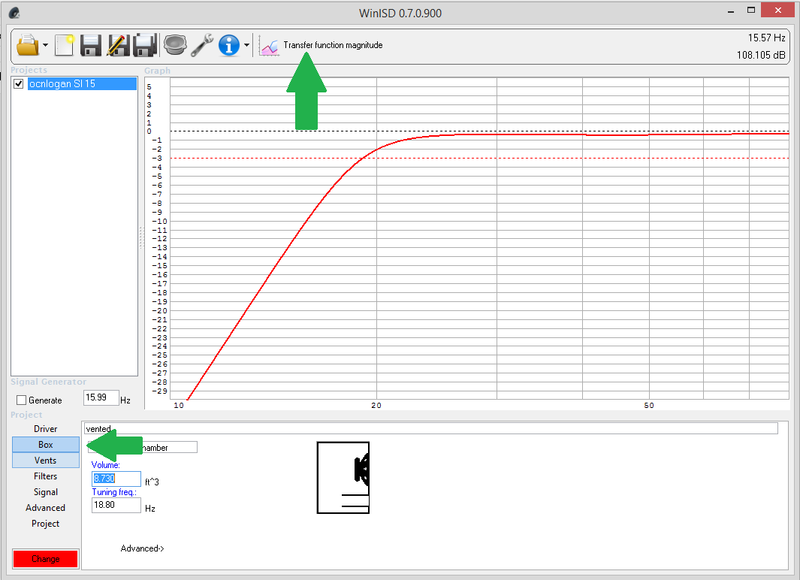 Generally I adjusted the settings on this tab in conjunction with the "Transfer function magnitude" graph. 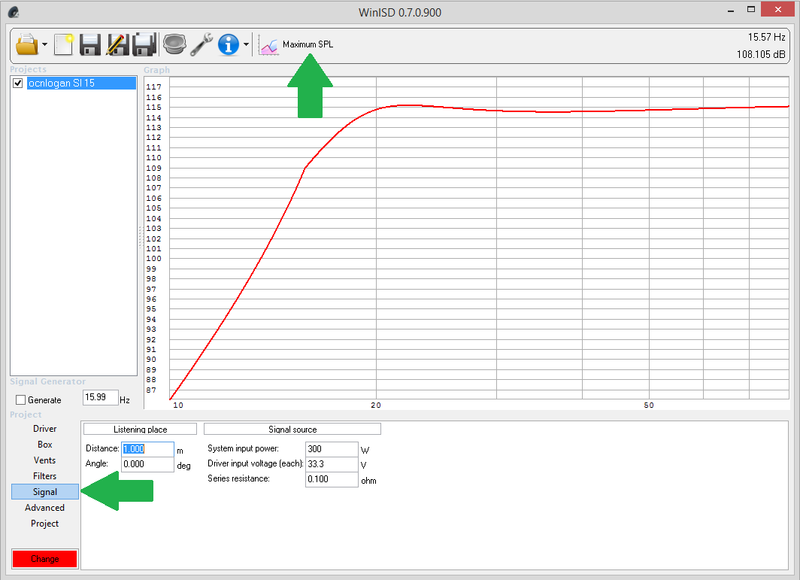 This shows the frequency extension of the subwoofer, and even includes the -3db point for it which is quite useful. The "vents" tab is where it shows you the size of the port that gave you the tuning frequency that you desired. The specifications of the port can be changed in this tab. One thing you need to know, is that the subwoofer volume does NOT include the volume of the port. So changing the port size affects how much volume you need to subtract from the subwoofer enclosure volume. This in turn changes the length of the port, which means that the volume being subtracted is changing. Its a vicious cycle. When you are adjusting anything with vents, you should be looking at the air velocity graph. Because a ported subwoofer does in fact move air through the port, its important to keep the air speed below a certain level to prevent that port from acting like a whistle. In my research I heard recommendations saying to keep the air speeds below 24 m/s, and below 17 m/s to eliminate any port noise (known as "chuffing" in subwoofer-speak). Because I wasn't hurting for space, I tried to stay below 17 m/s just to be on the safe side. The signal tab is where you get to specify the wattage of the amplifier. To really see the results from the changes to the wattage, you need to view them from one of the SPL graphs. 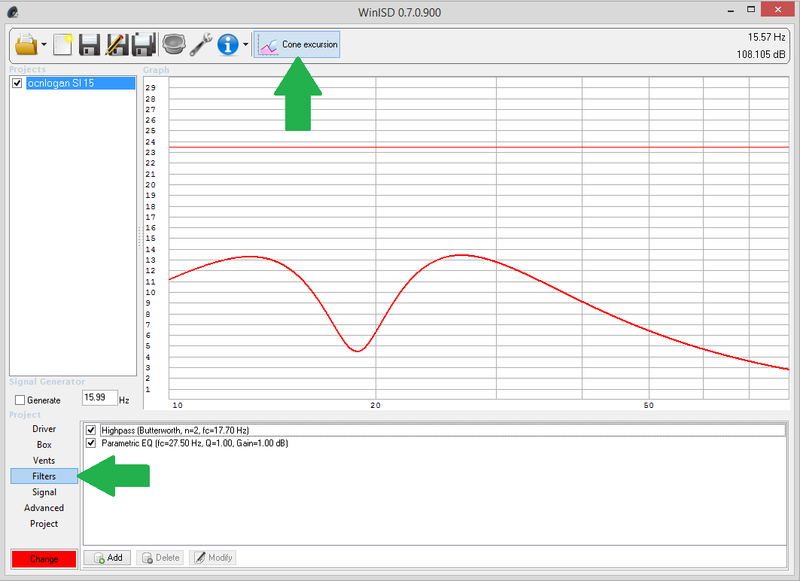 This is the maximum SPL tab, and you can see that while the previous transfer function magnitude graph showed the frequency extension, the maximum SPL graph shows the actual volume. 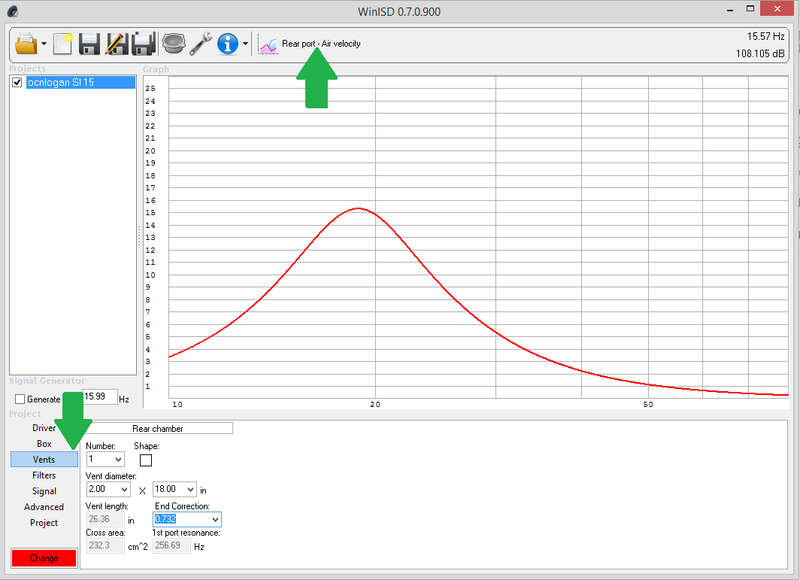 You can see from the graph, that my sub has a slight 1db dip centered roughly around 36hz. Generally you want the graph perfectly flat, obviously this isn't the case here. From what I understand from my research is that this isn't super common. The reason that speakers are measured to their +- 3db point is that that is a halving of volume. So to have a 1db drop in output isn't a huge concern to me. I could have made the enclosure smaller, and tuned it higher and flattened out the graph, but I was trying to sneak out as much extension as I could. And here we are at the last main topic. Now that you've done everything else in the design (enclosure size, tuning, air velocity, etc), there is one last main thing to check. Subwoofers rely on travel to move enough air to provide that "umph" in the low notes. Too much travel can damage a sub though, and each driver is different. The cone excursion graph is where you see the travel of the subwoofer in millimeters. The red line on top is the subwoofer drivers maximum extension. If the excursion goes over that line on the left, that is because the subwoofer is trying too hard to reproduce the really low notes as the low notes require more travel for the same volume. So if you filter out those low notes, the driver won't be pushed to travel as far, thus keeping it from self destructing. My design was over-excursing without any filters (bad). However the BASH 300w amplifier that I used has built in filters. It has a built in High Pass Filter, and a slight degree of bass boost (1db). This is how I accounted for them in the project, as both affect it. You can see that I'm nowhere close to maximum extension, even if my amplifier at full power. This means I shouldn't have to worry about damaging my driver. There you have it, now you all know about as much as it I do. If you have questions, I'm more than willing to do what I can to help out. However the people over at hometheatershack.com have much more experience than I do on this, so if this didn't help you, perhaps you should start an account there and ask your question.